Saving cucumber seeds is a bit more tricky than saving radish seeds. So how do you save seeds from a cucumber? First, start with a non-hybrid cucumber plant. You can get non-hybrid seeds at a number of places–I do my shopping online, and a couple of my favorites are Hometown Seeds and Baker Creek Heirloom Seeds. Or you can search for “heirloom seeds” or “non-hybrid seeds” and you’ll get plenty of other results. Hybrid plants will give you all kinds of random results when you plant their seeds–not all the kind you thought you planted. Remember Mendel’s peas? You want non-hybrids if you’re going to go through the hassle of saving seeds. 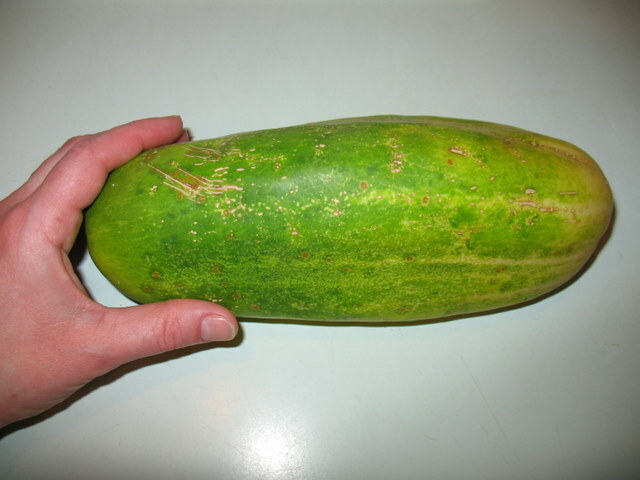 Bitterness in cucumbers is related to genetics, so if you’ve got a plant giving you more bitter tasting cucumbers, that’s not the one you want to save seeds from. I know this is tricky, especially if your cucumber plants are all intertwined, but taste a cucumber as you pick it, and if it’s good, trace that plant to another cucumber and put a ribbon or some other marker on the stem to remember that is the one you’ll be saving for seed. You can’t eat a cucumber and get seeds from it. At the eating stage, the seeds aren’t matured enough. So you let the cucumber you’re saving seeds from get big and kind of soft. After you pick it, you can leave it on your counter for a few more days (or weeks depending on your location). Don’t let it go moldy, but it will continue to ripen for a bit after picking. 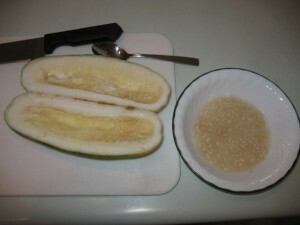 When it’s nice and big and softish, cut it open gently so you aren’t cutting seeds, and scoop the seeds out into a bowl. I guess at this point, you could eat the rest of the cucumber if you’re that hungry. We gave ours to the chickens. Each of the seeds are encased in a gel sack that needs to be removed, and the recommended process for gel sack removal is fermenting. When your seeds are in the bowl, add some water (about as much water as you have seeds). A deep bowl will work better than a shallow one–I don’t think I got enough water in here for the separation to be obvious, but it still worked. 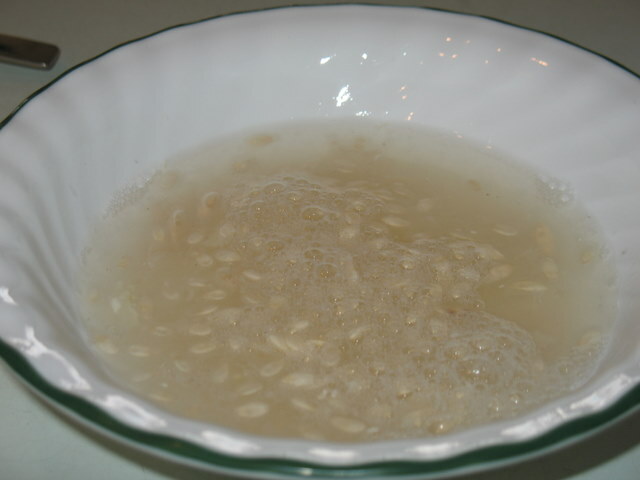 If you put too much water in, the fermenting process will be slowed or won’t work at all. 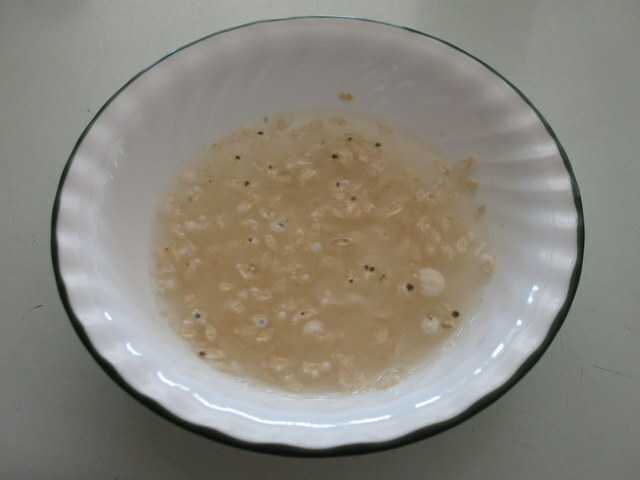 Then let the seed/water mixture sit on your counter for 2-3 days and get gross. Mine actually developed a bit of mold on the top–it may have gone a day too long, but I was waiting to see the gel sacks separate, and like I said, I don’t think I had enough water in the bowl to make the separation obvious enough, so I let it go until I was sure it was done. When the sacks have separated from the seeds, the sacks will be floating and the seeds will sink to the bottom of your bowl. Skim and pour the gel stuff off the seeds and rinse the seeds off. 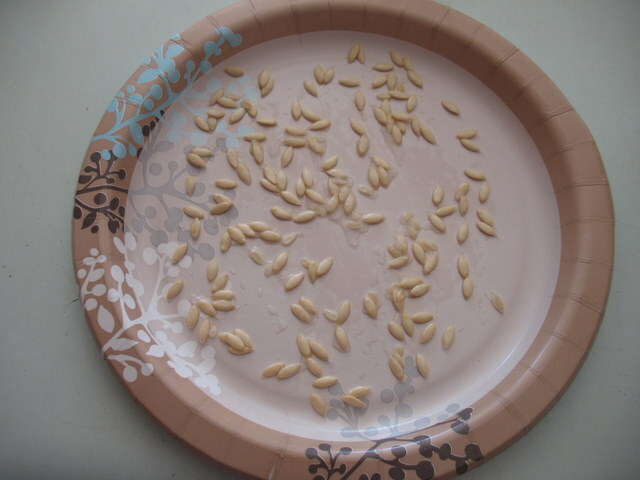 When the seeds are separated, they’ll be all clean and shiny and just the seed with no gross slimy stuff on them. Now lay them on a paper plate or something and let them dry for a week or so. They’re done when they snap in half instead of flexing when you try to bend them. Now you’ve saved seeds from a cucumber! That wasn’t too hard, right? Bag them up and label them and keep them in a cool, dry place. Then plant some next spring and see how they grow! Angela, I am glad that you did this post. I am a bit clueless when it comes to seed cultivation. I know we need non-hybrid seeds to be able to cultivate seeds from but I know no where near what I need to know about growing this stuff. This is the hard lesson I learned this year: I bought tiny watermellon and cantelope from the store, carefully saved the seeds and planted them. They grew beautiful fruit, I patted myself on my back and cut them for a nice dessert. Well guess what? they were YUKKY and we couldn’t eat any of them. I kept hoping the next one would be good, but NOOOO. So I figured they must have been hybrid and grown for long trips to the grocery stores or something. Shoot. Is that right? 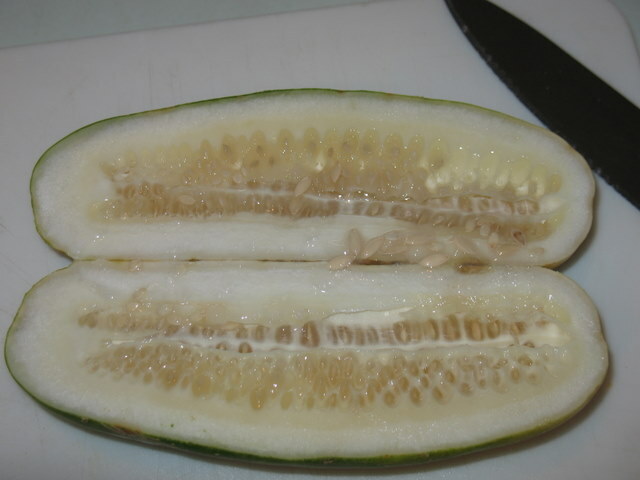 Yep, you probably got seeds from hybrid melons. You never know quite what you’ll get from those when you plant them. 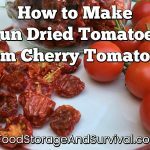 Best to start from scratch with an heirloom variety so you can save seeds from that. Thanks so much for the info. 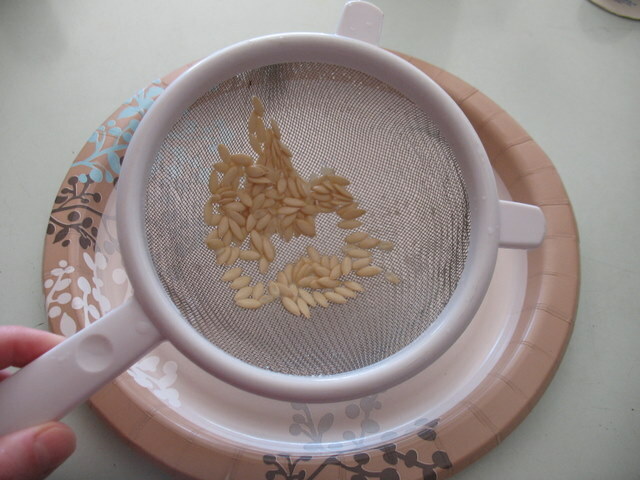 I’m just learning to save seeds, and this was very helpful. Thanks again.